This is a true water iris, it likes to be grown in water, however Iris laevigata is fairly easy to grow in containers as well. In Japan it is known as kakitsubata, and these tall growing Iris vary in both height and colour. Also known as the Rabbit Ear Iris as the petals hang down softly, like Rabbit Ears it is found from Siberia through to Japan. 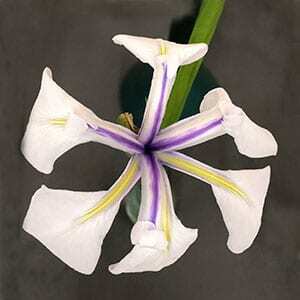 The species itself has royal blue petals with white markings, the many hybrids include white (snowdrift), blue with more pronounced white markings (colchesterensis) as pink and deep red varieties. Foliage is a bright to mid green and strap like. 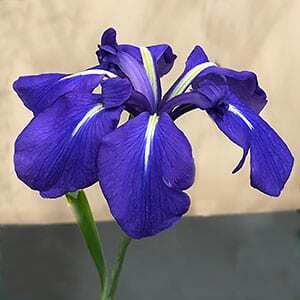 The easiest way to grow Iris laevigata is to plant it in a normal pot in a normal potting mix and place that in a container of water. You can place a layer of pebbles on top of the potting mix if you like. You can also grow it in the garden, as long as you have constantly moist soil. The ideal situation in the margins of pond, and here it can be planted in the moist shallow areas, or again, sink the pot into the water. You will need a position in good sun for this Iris to flowers well. Very good morning sun and a little afternoon shade will work, deep shade will give you foliage and no flowers. If growing in containers, use a large one. The roots (rhizome) like to spread and it does this quickly, so give it space. You will need to repot Iris laevigata every 2 – 3 years and this is good time to divide them. The time to divide them is immediately after flowering. It is the new rhizomes that you want, the old ones tend not to flower. Keep as much of the root system as possible, and repot or replant. You can also collect the seeds and propagate from these if you wish.